Nothing special about simple soup, except that it is so very satisfying. We make and eat a lot of soup, usually the hearty variety. But tonight I was after something lighter to round out an easy meal of leftover pasta*. So I made up a simple soup. Easy to make, nothing fancy about it. However simple soup … I can’t call it mine as there’s nothing original about it … is greater than the sum of its parts. Elegant, if you think of food in that way. Savory, satisfying, rich in nutrient-dense, health-making ingredients. Toss in a cup of beans if you like. 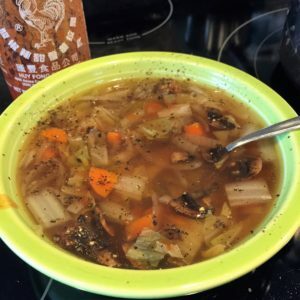 We seasoned our simple soup with more grinds of black pepper and some hot sauce. Hmmm. After two big bowlfuls a piece, there are leftovers to enjoy. And another bowlful could be a guilt-free snack, though I’m still full and sated, hours later. Here’s the recipe, below. Use the formula and make it your own. Enjoy! We ate two big bowlfuls of simple soup apiece, spiked with fresh black pepper and hot sauce. But a cup of simple soup could also be the starter to a multi-course dinner party meal, too. In a large pot, water- or stock-saute the garlic and onion until soft. Add carrots and cook along with the onions and garlic for a couple of minutes. 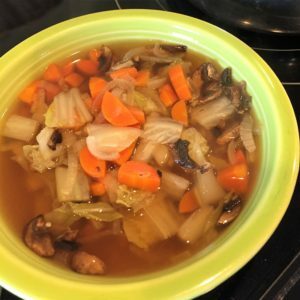 Add 10-12 cups of veggie stock, or water*, and bring to a boil, reduce heat, add several grinds of black pepper, add the mushrooms and cabbage, simmer for about 15 minutes until carrots are al dente. If you’re adding spinach, which is much lighter than the other greens mentioned, stir it in at the end instead of during the simmer. ** veggie stock. I make my own. It’s an easy way to use your vegetable trimmings and it saves a lot of money. I’ll be posting a how-to shortly. ***water. My daughter and son-in-law don’t always have stock on hand, so make simple soup with water as a base. Toss in some garlic powder and onion powder, maybe a 1/2 teaspoon of each to start, to build the flavor. easy, recipe, simple, snack, social, soup. Bookmark.